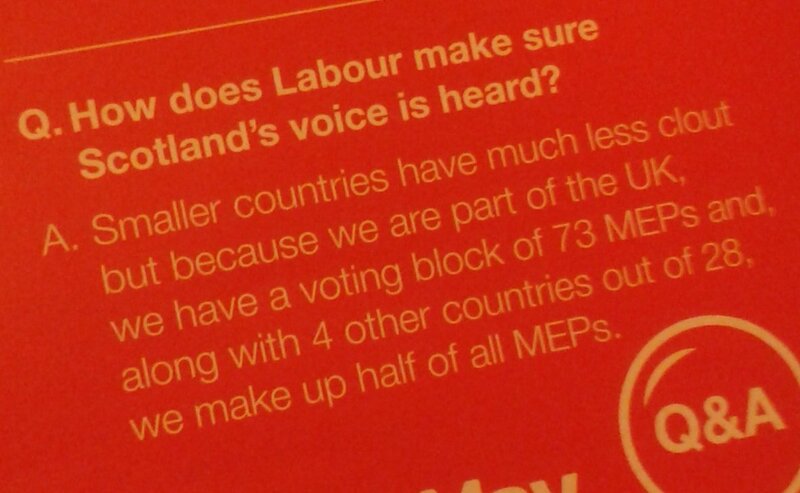 A bit of misinformation from Labour’s European Parliament election leaflet. One of the reasons why so many people are against the EU and why UKIP are finding it so easy to campaign for leaving it altogether is that most don’t know very much at all about how it functions. Q. How does Labour make sure Scotland’s voice is heard? A. Smaller countries have much less clout but because we are part of the UK, we have a voting block of 73 MEPs and, along with 4 other countries out of 28, we make up half of all MEPs. The numbers aren’t wrong, but what is crucially missing here is that MEPs very rarely vote along national lines. According to this report (PDF), members of each European political party group vote together around 90% of the time [p. 10]: It adds: “The only policy area that bucks this trend is agriculture: here, the European political groups are less cohesive than on other policy issues and some national delegations (particularly the French and the Scandinavians) vote along national lines”. 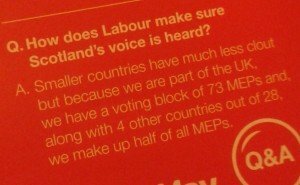 In other words, the fact that there are 73 UK MEPs but only 13 Danish ones is almost irrelevant because they only rarely (if ever) vote as a block; Labour should instead be talking about how their 13 MEPs (two of which are representing Scotland) form part of the S&D’s parliamentary group consisting of 190 members from most EU countries. Much more importantly, Scotland currently only has 6 MEPs, but as an independent country we would have 13 (the same as Denmark). This means that the S&D group would most likely contain four or five Scottish members instead of just two, dramatically increasing Scotland’s influence there. And of course the Scottish members would be free to vote together with the rUK ones whenever that would be desirable, so independence would only increase our influence in the European Parliament. How much does the MSM report on the EU? I have yet to see one single solitary newspaper article or TV program on the subject that is worth the time. Finding out about anything on the EU is like pulling teeth. I agree about the MSM and the EU, but finding out about the EU is actually very easy these days — there’s so much information on the Internet (Wikipedia, EU blogs and EU’s own websites for starters). The problem is that most people assume the MSM tell them what they need to know and don’t go looking for information elsewhere. Clarifying how the EU voting systems work. Just send Nigel Farage off on an intensive course in HTML5+CSS. That’ll keep him busy for a while. Interesting item on Radio 4 More or Less about the lie UKIP puts out about 75% of our laws coming from the EU. They are deliberately misquoting. The quote was a about what percentage of EU laws came from the parliament as opposed to other EU bodies such as the EU Commission (Barroso’s lot). It is nothing to do with what laws are enacted in the UK. I don’t hope anybody tries to get neutral information about the EU from UKIP! Er, Scotland currently had 73 MEPs. Even if they don’t all vote as a block, I don’t see why move to have only 13 is an improvement. Scotland currently has 6 MEPs (see Wikipedia), so going from 6 to 13 is definitely an improvement. There are 73 UK MEPs. They are all going to be broadly voting along common lines. When it comes to issues where Scotland the rUK will diverge heavily, such as fishing rights or oil producing countries shouldering responsibility for climate change, the reduction from 73 MEPs to 13 is going to feel very lonely. The thing is that the UK MEPs don’t generally vote as a block. 90% of the time, they vote with the rest of their political group in the European Parliament. For instance, the LibDems vote the same as the rest of the ALDE group, and the Labour MEPs vote with the German SPD members, the French socialists and many others in the European S&D group. So why are the 13 MEPs going to vote as a block, and not a divide between SNP and Labour MEPs (And probaly some LibDem MEPs)? I’m really stuck as to why this is an improvement. The 13 Scottish MEPs aren’t going to vote as a block most of the time, but doubling the number of representatives will of course increase our influence — for instance when the political groups decide on their stance on various topics.